This tour is Tina Turner's biggest outing to date. Performing over 250 dates in Europe, North America and Australasia—surpassing her Break Every Rule Tour in 1987. Lasting nearly 16 months, the tour is estimated to have grossed over $100 million dollars. 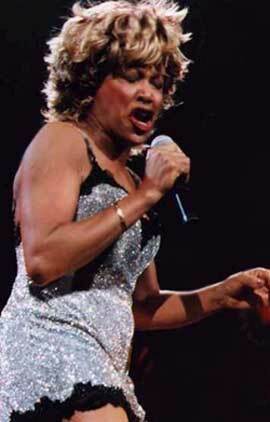 The tour was sponsored by Hanes, as Tina Turner became the spokesperson for their new hosiery line. The tour was financially successful, especially in North America. It is estimated that tour grossed over 20 million dollars with an attendance of over 650,000 spectators. Shortly after the release of the James Bond theme GoldenEye, Tina Turner announced that she will embark on a tour in the Spring of 1996. The tour unofficially began with six rehearsal dates in Asia, Africa and Europe. In April 1996, Turner performed a private concert for the niece of Sultan Hassanal Bolkiah of Brunei. During rehearsals, Tina Turner performed her only concerts to date in the southeast Asia region and Africa. While performing in Johannesburg, Tina Turner was joined onstage by Vusa Dance Company to perform "Do What You Do". After the performance, Turner approached dancer David Matamela and gave him a scholarship to the Alvin Ailey Dance School. Despite current issues in South Africa for concert tours, Tina Turner's South African leg proved to be successful playing to over 100,000 spectators. During rehearsals, Tina Turner was not impressed with the stage design. She felt the stage was too dark and felt awkward to perform on. It was later reworked to Tina Turner's liking. Elements of the stage can be seen in Tina Turner's 50th Anniversary Tour,(which took place in 2008 and 2009). "She is our goddess of rock 'n' roll. We are going to be right there with Miss Tina. We're going on tour with Tina. "The Oprah Show" is actually going on the road with Tina. 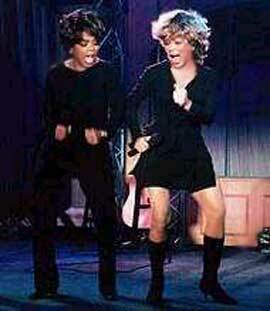 I am the biggest Tina Turner fan there is. It is my wildest dream." "It could be by best tour ever in America. when I walk on stage, there's such a feeling of face looking back at me with love and admiration. And it turns into a togetherness. It really is about a deist from the people. The last tour I actually announced to my audience that I would be back. it was only because of that feeling, because that's the kind of audience I have." During the tour, pianist Kenny Moore suffered health problems. In Sydney, New South Wales, he was admitted to the hospital and later pronounced deceased due to apoplexy. Moore has worked with Tina Turner since 1977. Chuck Booker replaced Moore for the remaining dates of the tour. 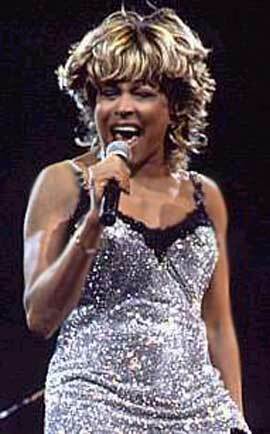 Tina Turner dedicated every performance thereafter to Moore. After successfully touring New Zealand Tina Turner returned to an expanded tour in the region. The leg proved to be a success for Tina Turner as dates quickly sold out. However, during her concert in Wellington, New Zealand, Tina Turner was removed from the stage and the building was later evacuated by local police due to a possible bomb at the venue. After a full sweep of the building, Tina Turner resumed the concert nearly three hours later. The same incident happened in Palmerston North. 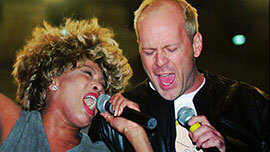 * During performances at the Palais Omnisports de Paris-Bercy in Paris, France (May 1997 - 1996), Tina Turner performed "Unfinished Symphony" with Bruce Willis and his band, "The Accelerators". * During the performances at the Amsterdam Arena in Amsterdam, North Holland, Netherlands, Tina Turner performed "Something Beautiful Remains" for the concert filming. The song was performed in lieu of "Dancing in My Dreams and was not included in any other performance during the tour. 6. "In Your Wildest Dreams"
8. "River Deep – Mountain High"
10. "We Don't Need Another Hero (Thunderdome)"
12. "Undercover Agent for the Blues"
14. "Better Be Good to Me"
17. "What's Love Got to Do with It"
21. "Dancing in My Dreams"
2. "Do What You Do"
3. "River Deep – Mountain High"
5. "In Your Wildest Dreams"
8. "We Don't Need Another Hero (Thunderdome)"
10. "I Can't Stand the Rain"
11. "Undercover Agent for the Blues"
13. "Giving It Up for Your Love"
3 May 1996 - Bercy - Paris - France - 15000 - S.O. 4 May 1996 - Bercy - Paris - France - 15000 - S.O. 5 May 1996 - Bercy - Paris - France - 15000 - S.O. 9 May 1996 - Flanders Expo - Gent - Belgium - 13300 - S.O. 10 May 1996 - Flanders Expo - Gent - Belgium - 13300 - S.O. 11 May 1996 - Flanders Expo - Gent - Belgium - 13300 - S.O. 12 May 1996 - Flanders Expo Gent B 13000 - S.O. 13 May 1996 - Flanders Expo Gent B 13000 - S.O. 6 June 1996 - Globe - Stockholm - Sweden - S.O. 7 June 1996 - Globe - Stockholm - Sweden - S.O. 9 June 1996 - Scandinavium - Gothenberg - Sweden - 10500 - S.O. 12 June 1996 - Spectrum - Oslo - Norway - 8000 - S.O. 13 June 1996 - Spectrum - Oslo - Norway - 8000 - S.O. 14 June 1996 - Spectrum - Oslo - Norway - 8000 - S.O. 21 June 1996 - Parken Stadion - Copenhagen Denmark - 28000 - S.O. 22 June 1996 - Volksparkstadion - Hamburg - Germany - 40000 - S.O. 28 June 1996 - Croke Park - Dublin - Ireland - S.O. 30 June 1996 - Murray Field Stadium - Edinburgh - UK - 40000 - S.O. 12 July 1996 - International Stadium - Gateshead - UK - 12500 - S.O. 18 July 1996 - Don Valley Stadium - Sheffield - UK - 51500 - Record! 20 July 1996 - Wembley Stadium - London - UK - 69000 - S.O. 21 July 1996 - Wembley Stadium - London - UK - 71000 - S.O. 22 July 1996 - Wembley Arena - London - UK - 11000 - S.O. 24 July 1996 - Arena - Nimes - France - 12000 - S.O. 25 July 1996 - Arena - Nimes - France - 12000 - S.O. 27 July 1996 - Müngersdorfer Stadion - Cologne - Germany - 60000 - S.O. 7 Aug. 1996 - Olympic Stadium - Helsinki - Finland - 50000 - S.O. 8 Aug. 1996 - Football Stadium - Kolding - Denmark - - S.O. 9 Aug. 1996 - U Lievi Stadium - Gothenberg - Sweden - 37000 - S.O. 10 Aug. 1996 - Spectrum - Oslo - Norway - 8000 - S.O. 11 Aug. 1996 - Spectrum - Oslo - Norway - 8000 - S.O. 21 Aug. 1996 - Nepstadion - Budapest - Hungary - 70000 - S.O. 22 Aug. 1996 - Bohemians - Prague - Tjechia - 20000 - S.O. 23 Aug. 1996 - Gwardia Stadium - Warsaw - Poland - 38000 - Record! 26 Aug. 1996 - Flanders Expo - Gent - Belgium - 13300 - S.O. 27 Aug. 1996 - Flanders Expo - Gent - Belgium - 13300 - S.O. 29 Aug. 1996 - Flanders Expo - Gent - Belgium - 13300 - S.O. 30 Aug. 1996 - Flanders Expo - Gent - Belgium - 13300 - S.O. 31 Aug. 1996 - Flanders Expo - Gent - Belgium - 13300 - S.O. 1 Sept. 1996 - Flanders Expo - Gent - Belgium - 13000 - S.O. 6 Sept. 1996 - Amsterdam Arena - Amsterdam - The Netherlands - 48145 - S.O. 7 Sept. 1996 - Amsterdam Arena - Amsterdam - The Netherlands - 48204 - S.O. 8 Sept. 1996 - Amsterdam Arena - Amsterdam - The Netherlands - 48811 - S.O. 11 Sept. 1996 - Bercy - Paris - France - 15000 - S.O. 12 Sept. 1996 - Bercy - Paris - France - 15000 - S.O. 13 Sept. 1996 - Bercy - Paris - France - 15000 - S.O. 17 Sept. 1996 - San Jordi - Barcelona - Spain - 17000 - S.O. 18 Sept. 1996 - San Jordi - Barcelona - Spain - 17000 - S.O. 25 Sept. 1996 - The Forum - Milan - Italy - 10000 - S.O. 26 Sept. 1996 - The Forum - Milan - Italy - 10000 - S.O. 27 Sept. 1996 - Palasport - Bologna - Italy - 13000 - S.O. 28 Sept. 1996 - Palasport - Bologna - Italy - 13000 - S.O. 30 Sept. 1996 - Tony Garnier - Lyon - France - 17600 - S.O. 17 Oct. 1996 - MECC - Maastricht - The Netherlands - 18045 - S.O. 18 Oct. 1996 - Messehalle - Leipzig - Germany - 9000 - S.O. 19 Oct. 1996 - Messehalle - Leipzig - Germany - 9000 - S.O. 20 Oct. 1996 - Messehalle - Leipzig - Germany - 9000 - S.O. 25 Oct. 1996 - Westfalenhalle - Dortmund - Germany - 12000 - S.O. 26 Oct. 1996 - Westfalenhalle - Dortmund - Germany - 12000 - S.O. 27 Oct. 1996 - Westfalenhalle - Dortmund - Germany - 12000 - S.O. 30 Oct. 1996 - Hallenstadion - Zürich - Switzerland 12000 - S.O. 31 Oct. 1996 - Hallenstadion - Zürich - Switzerland 12000 - S.O. 5 Nov. 1996 - Kremlin Palace - Moscow - Russia - S.O. 6 Nov. 1996 - Kremlin Palace - Moscow - Russia - S.O. 9 Nov. 1996 - Schleyerhalle - Stuttgart - Germany - S.O. 10 Nov. 1996 - Schleyerhalle - Stuttgart - Germany - 21770 - S.O. 13 Nov. 1996 - Festhalle - Frankfurt - Germany - 12000 - S.O. 14 Nov. 1996 - Festhalle - Frankfurt - Germany - 12000 - S.O. 15 Nov. 1996 - Festhalle - Frankfurt - Germany - 12000 - S.O. 16 Nov. 1996 - Festhalle - Frankfurt - Germany - 12000 - S.O. 19 Nov. 1996 - Wembley Arena - London - UK - 12000 - S.O. 20 Nov. 1996 - Wembley Arena - London - UK - 12000 - S.O. 21 Nov. 1996 - Wembley Arena - London - UK - 12000 - S.O. 23 Nov. 1996 - Thialf - Heerenveen - The Netherlands - 15012 - S.O. 24 Nov. 1996 - Thialf - Heerenveen - The Netherlands - 15013 - S.O. 25 Nov. 1996 - Westfalenhalle - Dortmund - Germany - 12000 - S.O. 30 Nov. 1996 - Sheffield Arena - Sheffield - UK - 12500 - S.O. 1 Dec. 1996 - SECC - Glasgow - UK - 10000 - S.O. 2 Dec. 1996 - SECC - Glasgow - UK - 10000 - S.O. 5 Dec. 1996 - Nynex - Manchester - UK - 15000 - S.O. 6 Dec. 1996 - Nynex - Manchester - UK - 15000 - S.O. 7 Dec. 1996 - Nynex - Manchester - UK - 15000 - S.O. 11 Dec. 1996 - NEC - Birmingham - UK - 12000 - S.O. 12 Dec. 1996 - NEC - Birmingham - UK - 12000 - S.O. 13 Dec. 1996 - NEC - Birmingham - UK - 12000 - S.O. 14 Dec. 1996 - NEC - Birmingham - UK - 12000 - S.O. 18 Dec. 1996 - Wembley Arena - London - UK - 12000 - S.O. 19 Dec. 1996 - Wembley Arena - London - UK - 12000 - S.O. 20 Dec. 1996 - Wembley Arena - London - UK - 12000 - S.O. 11 March 1997 - Entertainment Centre - Sydney - Australia - 11500 - S.O. 12 March 1997 - Entertainment Centre - Sydney - Australia - 11500 - S.O. 1 May 1997 - The Cynthia Woods Mitchell Pavillion - Houston - USA - 12244 - S.O. 2 May 1997 - The Cynthia Woods Mitchell Pavillion Houston - USA - 12485 - S.O. 6 May 1997 - Tingley Coliseum - Albuquerque - USA - S.O. 12 May 1997 - Greek Theater - Los Angeles - USA - 6000 - S.O. 13 May 1997 - Greek Theater - Los Angeles - USA - 6000 - S.O. 15 May 1997 - Greek Theater - Los Angeles - USA - 6000 - S.O. 16 May 1997 - Greek Theater - Los Angeles - USA - 6000 - S.O. 17 May 1997 - Arrowhead Pond Anaheim, CA - USA 18000 - S.O. 18 May 1997 - Greek Theater - Los Angeles - USA - 6000 - S.O. 21 May 1997 - Concord Pavilion - Concord - USA - 12500 S.O. 25 May 1997 - General Motors Place - Vancouver - Canada - 18000 - S.O. 29 May 1997 - Delta Center - Salt Lake City - USA - 19000 - S.O. 27 June 1997 - Mark Of The Quad Cities - Moline - USA - 12000 - S.O. 5 July 1997 - Molson Center - Montreal - Canada - 14500 S.O. 18 July 1997 - Great Woods Performing Arts Center - Boston - USA - 15000 S.O. 19 July 1997 - Great Woods Performing Arts Center - Mansfield - USA - 15000 S.O. 22 July 1997 - Radio City Music Hall - New York - USA - 7000 S.O. 23 July 1997 - Radio City Music Hall - New York - USA - 7000 S.O. 25 July 1997 - Radio City Music Hall - New York - USA - 7000 S.O. 26 July 1997 - Radio City Music Hall - New York - USA - 7000 S.O. 27 July 1997 - Radio City Music Hall - New York - USA - 7000 S.O. 29 July 1997 - Radio City Music Hall - New York - USA - 7000 S.O. 30 July 1997 - Radio City Music Hall - New York - USA - 7000 S.O.